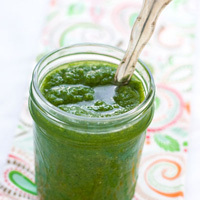 Good pesto doesn’t depend on exact ingredient amounts, so feel free to tailor it to suit your tastes. Slowly stream in the olive oil while the food processor is on. Then scrape down the sides of the food processor bowl and add Parmesan. Pulse until well combined. Add salt and pepper to taste.